Begin with freshly roasted pumpkins (or canned) and add creamy coconut milk, crunchy cashews, and curry for a super special soup that will make your taste buds dance with joy. I eat soup for dinner at least once every week (here’s why) and there are quite a lot of recipes on my blog. That said, it’s been a while since featuring my favorite supper. 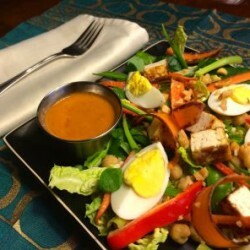 Enter today’s dish, which was originally created during a marathon cooking day when I was preparing several different varieties to send my sister for the holidays (“the gift of soup”). 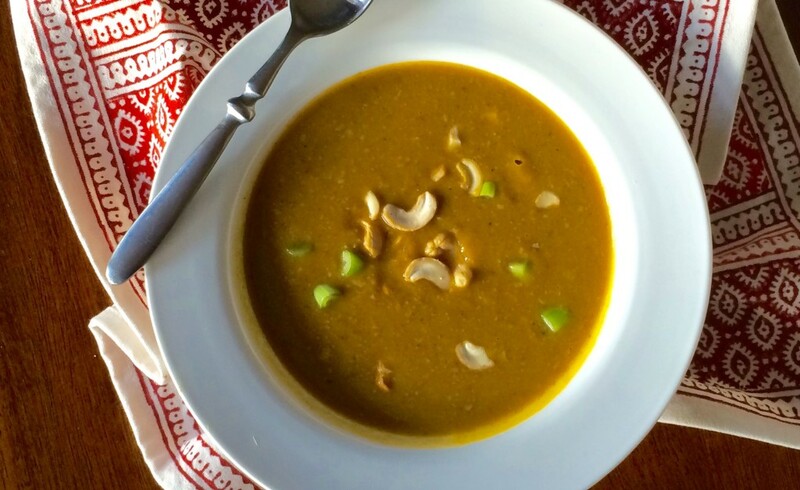 While roasted squash soup of any kind is delicious on its own, when it gets together with fabulous Thai ingredients the result is a luscious meal that’s loaded in nutrition and filling enough to warrant the starring role at your supper. Below is the how-to and some notes on why it’s so good for you. This is a great starter soup for those new to curries, since it only uses dried curry powder thus is quite mild. Do note that any kind of squash could be used in this soup if you don’t want to use pumpkin—although it’s really fun to roast them, and here’s how. And don’t forget to toast the seeds (try my spicy-sweet pepitas)! 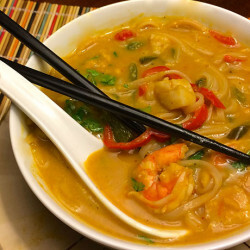 The soup is similar in style to my Vietnamese noodle soup, so if you like this dish it’s worth looking at that post because you’ll see the recipes are in fact different: the Vietnamese soup brings in several more traditional ingredients such as lemongrass, lime juice, tamarind, and red curry paste. Finally, do keep in mind that depending on what squash(es) you use, you might need a touch of sweetener for balance. After my soup sat for a few hours, I retasted it and added a little honey to complete the dish (agave is also fine for a vegan version); it really was needed since pumpkins are less sweet than, say, butternut squash. 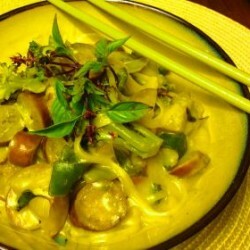 Whatever squashes you choose and whichever of the recipes you use to bring the tantalizing taste of Southeast Asia to you table, playing around with these fantastic spices—the key to great cooking—is sure to bring a lot of joy into your next soup. 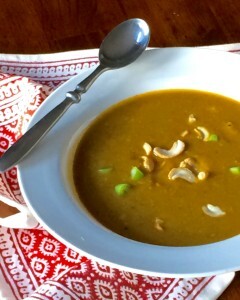 2015 Update: When I recently remade this soup for Thanksgiving, I changed it up a bit to give it an Indian twist. The recipe is almost the same as the video but: I added minced red habanero to the vegetable mix for heat, and I added cumin powder, mustard powder, garam masala, and a bit of coriander, as well as honey. I also used a hand blender to create a homogeneous texture. The final soup was superb—better than the original, I’d say, although I like bold spices. And, true to Indian cooking, a dollop of yogurt made a fabulous accompaniment.